Age: The upperparts on this bird have neat pale fringes that immediately suggest a juvenile. The jet-black bill and pointy tips to the primaries also support a 1st cycle individual. Identification: The medium, even-brown, tones with very little contrast throughout the plumage is only expected in a couple of taxa in North America. An initial view of the extensive pale edging wrapped around the primary tips should call to mind juvenile Glaucous-winged Gull or Thayer's Gull. A date and location, or other birds in the frame for comparison, would easily settle this in the field, but we'll try to do without that information. Afterall, what do we have to lose? A couple of salient features that Glaucous-wingeds regularly show - but not so much in thayeri - include a plain, muddied, greater covert panel. In thayeri, the greater coverts tend to show more internal markings with a frosted appearance - more illustrious, if you will. 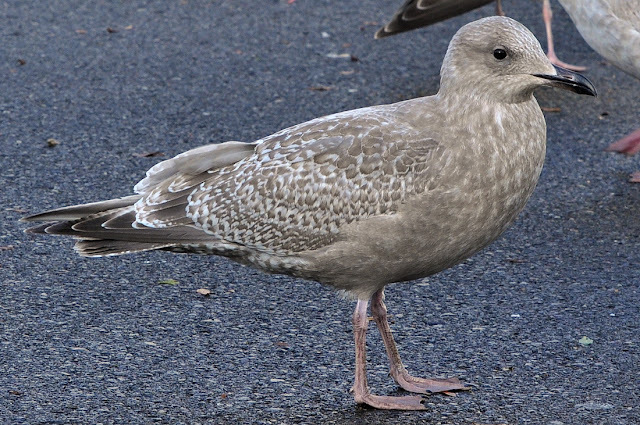 The plain upper tail, plain tertial tips, plain scapulars and plain wing coverts nicely work together to shape this "muted" look we expect in Glaucous-winged Gull. 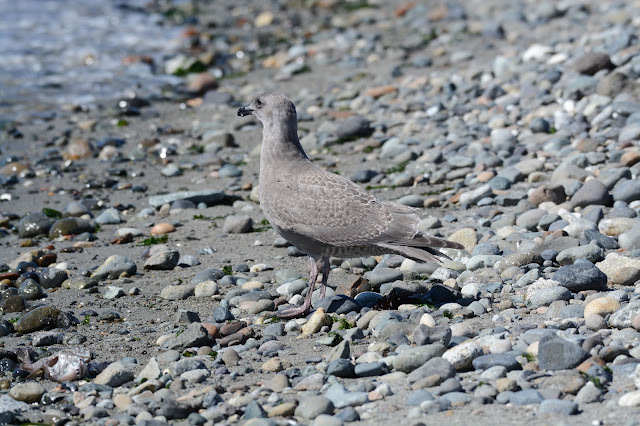 Our December quiz bird is indeed a juvenile Glaucous-winged, photographed in King County, Washington during the first week of September. Greater coverts show more internal markings, and overall, the upperparts are more contrasty and patterned. An ID like this, where Glaucous-wingeds and Thayer's overlap, must also take size and structure into consideration.